Wool producers, judges and the audience will dialog about the pros and cons of the fleece being shown. Considering the logic that there is no such thing as a “bad” fleece, what is the best use for the fleece being presented? Should you keep breeding for this kind of wool or cull the animal that produced it? If someone were to purchase this fleece from you what would you tell them about it? If not suitable for spinning and weaving, what other uses could there be for the fleece? We will also discuss how to skirt and store a fleece, value added uses, how to price and sell wool, the difference between the commodity market and a specialty market for wool and related topics. You will receive a score card on your fleece with a small ribbon attached. Blue = outstanding, red = excellent, yellow = desirable or white = undesirable as a Navajo Churro fleece. 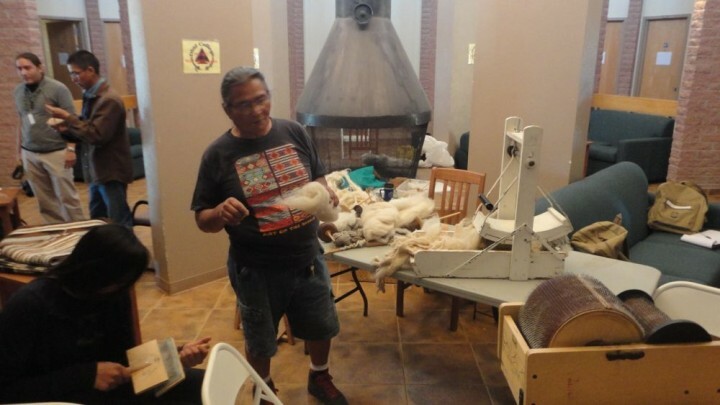 The purpose of this approach is to improve our collective knowledge as producers and breeders of Navajo Churro Sheep and as fiber artists. We will gain a deeper understanding about how to handle the wool we produce while learning from each other in a friendly atmosphere. You will have a few minutes to discuss what you see as the pros and cons of the fleece you are showing. The judges will examine the fleece and discuss what they see as the pros and cons of each. The audience will have a few minutes to ask questions as time allows. We will divide fleeces into these categories. We will show by class of fleece and will show as many fleeces as we have time for. The judges may adjust the classes as they determine necessary. There is no fee for participation in the show, however if you can afford to make a donation to help DBI cover costs of this event, we would appreciate it. You may pre-register or register at 9:00 AM on Friday the 21st. Lewis CO, 81327 or bring to show. Contact Cindy at wnc@gobrainstorm.net or call 970-739-2445 for information and questions.